GAP trousers - one pair going spare! 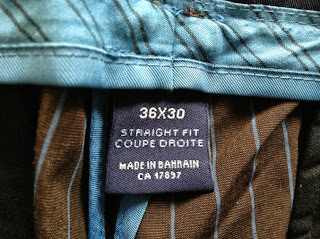 Now that I have my haul of nine pairs of GAP trousers in hand - enough for TWO whole suits - I discover I actually have one pair extra that I shan’t be needing. 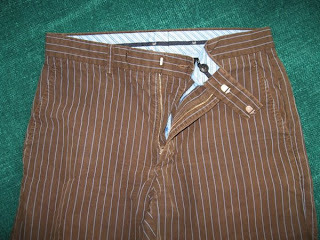 They are size 32 x 32, mint, still tagged and unworn. If you are a SERIOUS buyer, do get in touch and make me an offer! I do have a figure in my mind, below which I cannot possibly sell them for - but it’s always worth getting in touch. 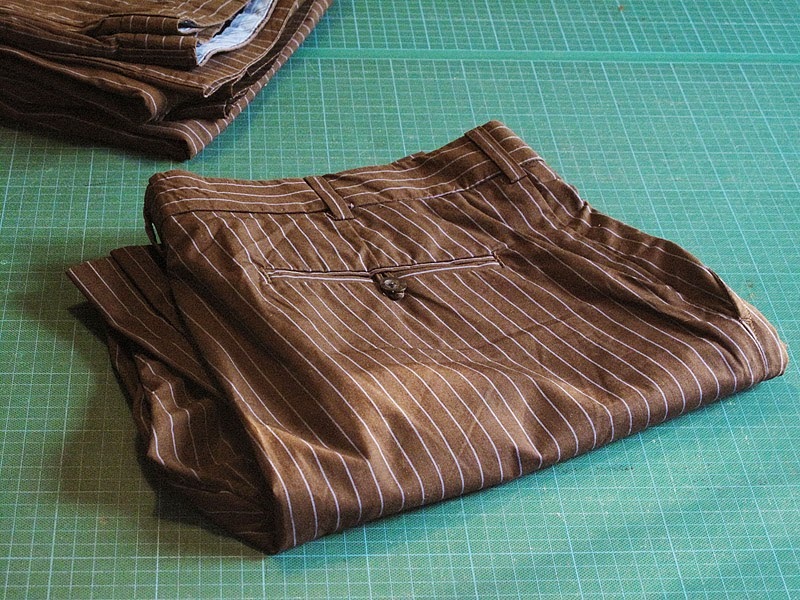 As you may have read, I’m slowly getting my GAP trousers together to make myself an Ultimate Tennant Suit. Progress will always be slow as these were from the summer 2005 range, so haven’t been made for years. That said, they do turn up from time to time on eBay, or through the forums where fans trade their costumes. The last pair I found were on eBay in September, and I had to pay £150 to secure them. So imagine my excitement this morning to find a pair on eBay with a £15 starting price - and on a BuyItNow! I click that CommitToBuy button quicker than I could blink. This puts me over halfway. 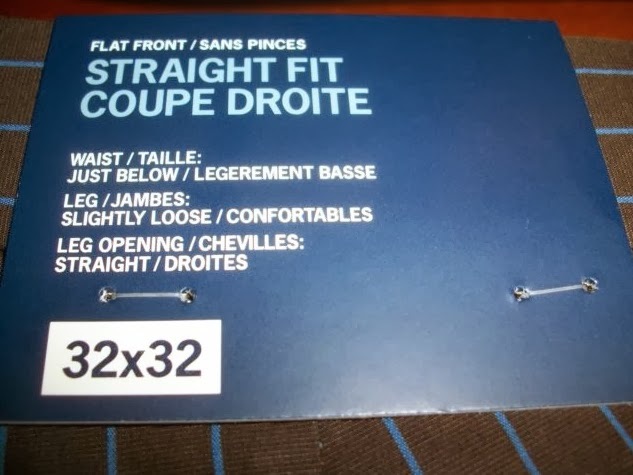 I already have two pairs of waist 36 and one of waist 34, so these 32s will be forming the sleeves of my suit - when I can get on to making it! 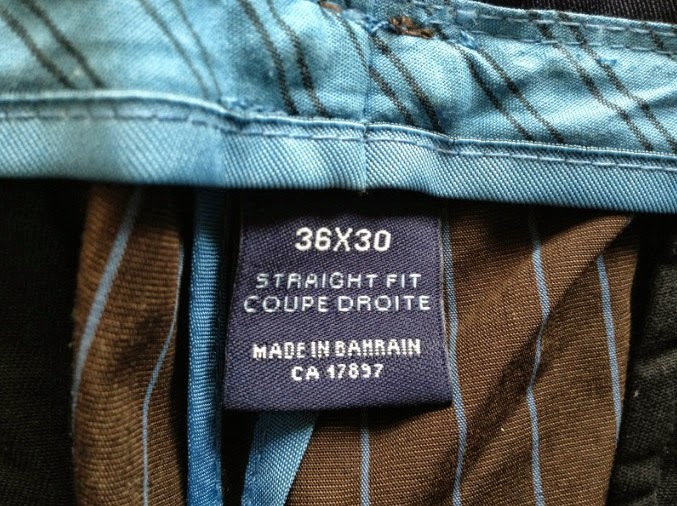 It was only after that I checked their size - waist 32 - and noticed they were still tagged, so had never been worn! I then started to write-up this entry you’re reading and was pulling in the description text from the listing, when I actually bothered to read it properly! So this means there are actually TWO pairs on offer through this auction! 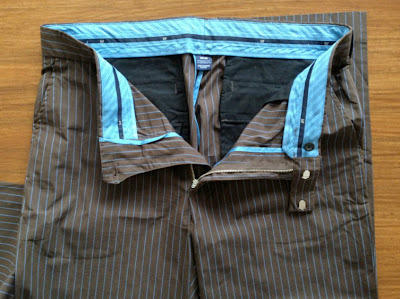 This will make FIVE pairs of GAP trousers - just one short of a suit! 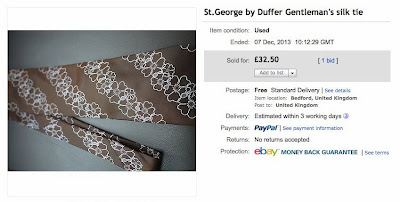 I contacted the seller straight away to check he still had them and to make an offer for them. I gave him my number and within a few minutes I had a rather gob-smacking text. Sorry? Hold on a minute. What was that???? We have gone from ONE pair (which would be great) to TWO pairs (which is even better) to a staggering EIGHT pairs??!!! E-I-G-H-T???? It wasn’t that I didn’t believe him - but I did want to see and confirm what we were talking about, so I asked him to text me a photo of all eight pairs. And there they are - all EIGHT pairs - all mind and still tagged, unworn. We agreed the price; I paid my money; and will be getting them very soon. 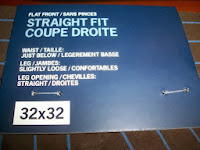 I do not want to be looking a gift horse in the mouth, but it’s a shame they are all waist 32. At least I have a couple of 36s to cover the larger panels of the suit when it comes to it. This will put my tally to ELEVEN pairs - more than enough for my suit which I can’t wait to get on to making in the new year. You can’t imagine how excited I am to finally complete this first stage of making the suit. It’s like Christmas has come early!!! 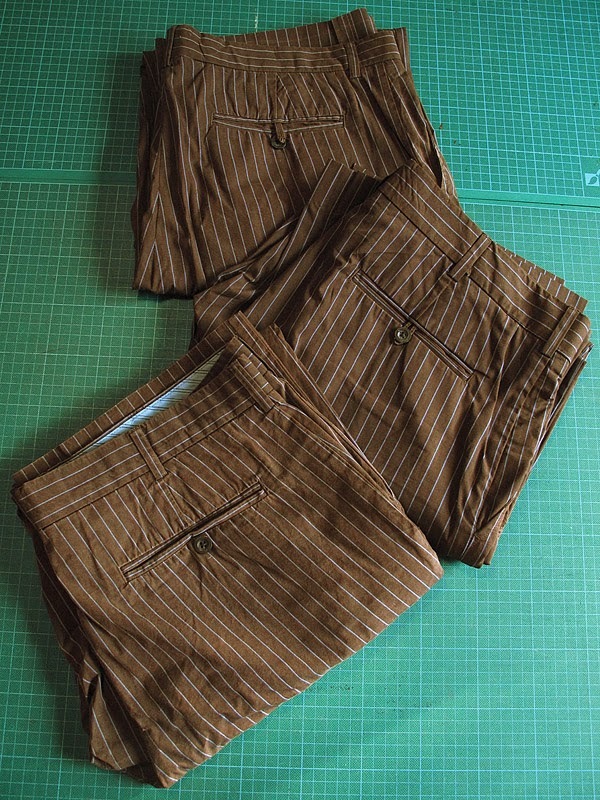 Just to clarify, none of these trousers are for sale. I am using them to make myself a suit, and potentially for one lucky client in the future. The begging letter have started and will be ignored. Sorry. 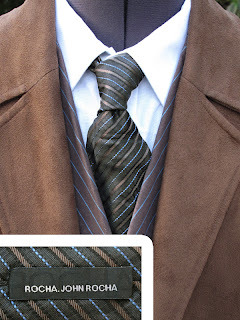 LAST Of The Time Lords Tie? 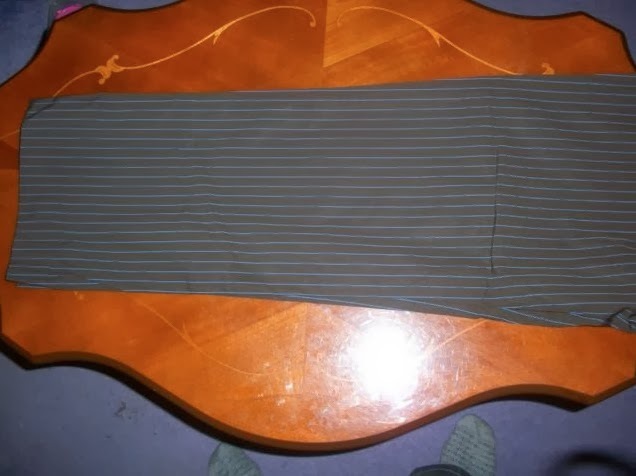 You know, since we started to become label-aware of the ties worn by the Tenth Doctor, I’ve been keeping a good eye open on eBay to see what comes up. 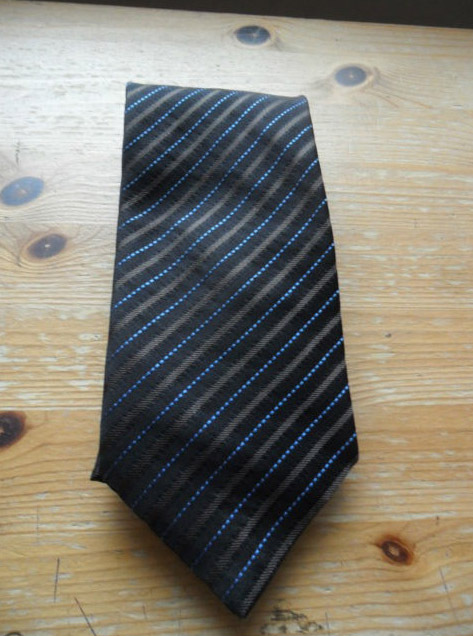 In my time I have only seen one of the Thomas Nash (Tie Five) for sale; I’ve spied a few Georgio Armanis (Tie Seven) including a few in differing colour ways; and only ever a solitary Christian Lacroix (Tie Four) but that too was in an alternative colour combination. 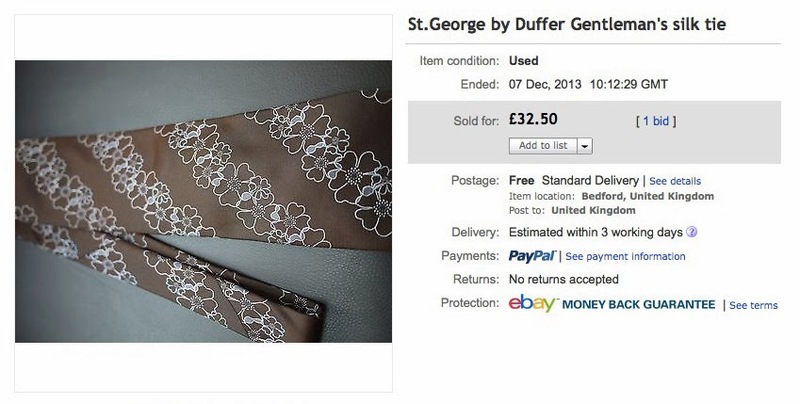 I’m sure others have been available, but the one that KEEPS cropping up the the St George By Duffer (Tie Ten), and just to prove that another was on sale this past week. 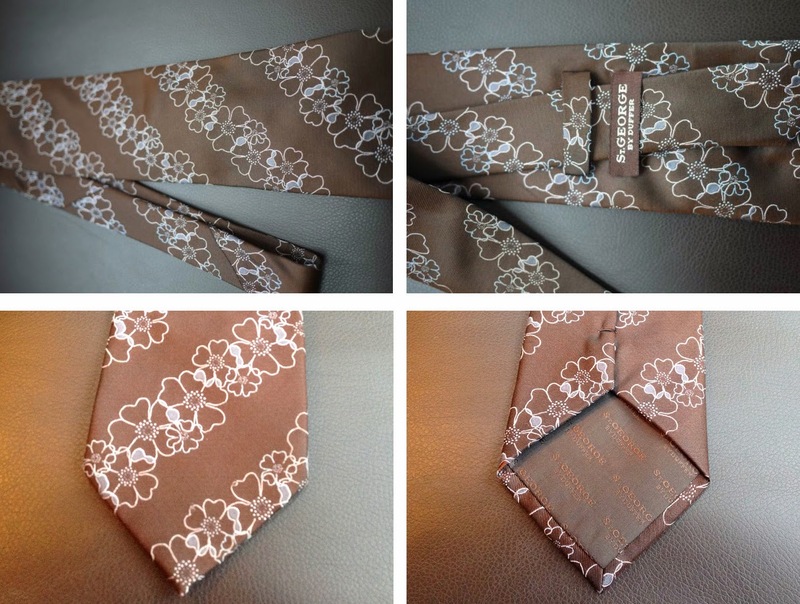 With the increasing better and better copies available, I did just check with the seller and can confirm it is a genuine St George tie. 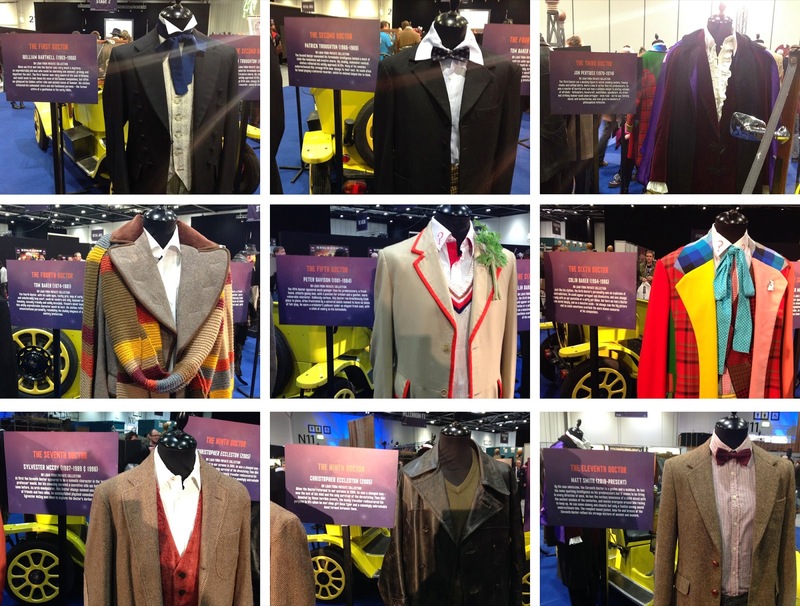 Fans of the costumes on Doctor Who had a treat in store with the extensive exhibition, as well as the Wardrobe Workshop where you could meet members of the costume department. But one little gem tucked away in a corner of the main hall was an original wardrobe trailer used by the costume department. This was one of the big green buses you see loitering around when location filming is taking place. Its plain exterior hid the treasure trove of costuming contained inside, and once you did get inside - there was only space for a dozen people at any one time - there was not restrictions to rifling through the racks and having a good nose at the contents of the hangers. Just inside the door is a sort of office area, with benches on each side where sewing machines could be set up for use. 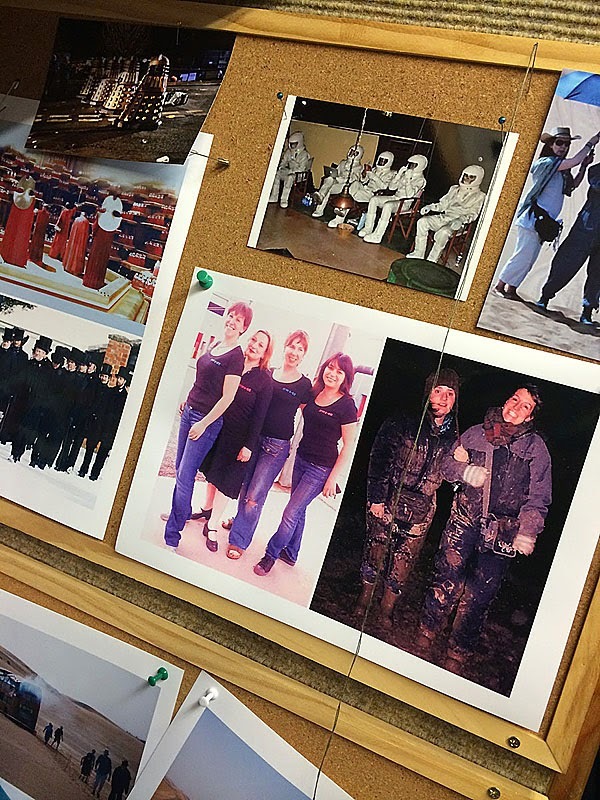 On the walls were a variety of continuity photos from the filming. 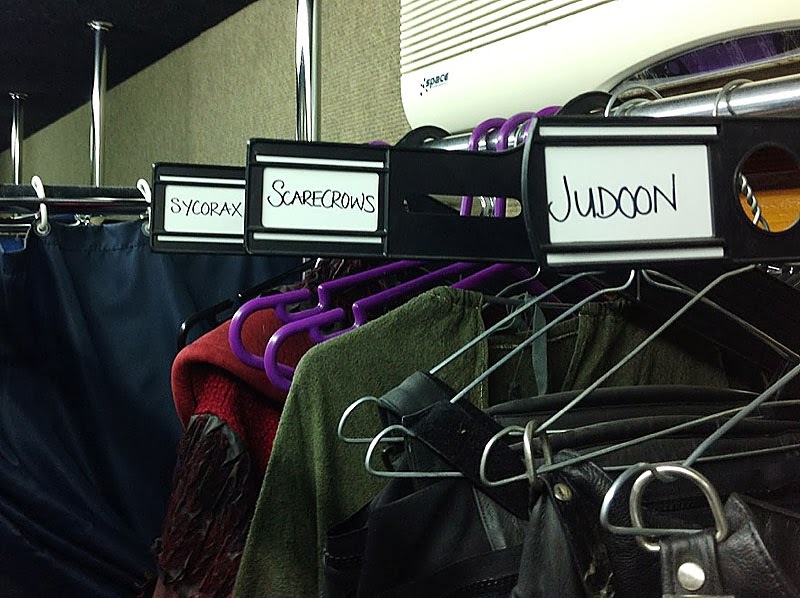 Beyond this area were the costume rails. They roughly went in season order down one side, and back up the other. Above the rails are tags, which once you looked closely didn’t always relate to what was below. Amongst all the monster and supporting players costumes, there were some choice items for die hard Doctor fans. 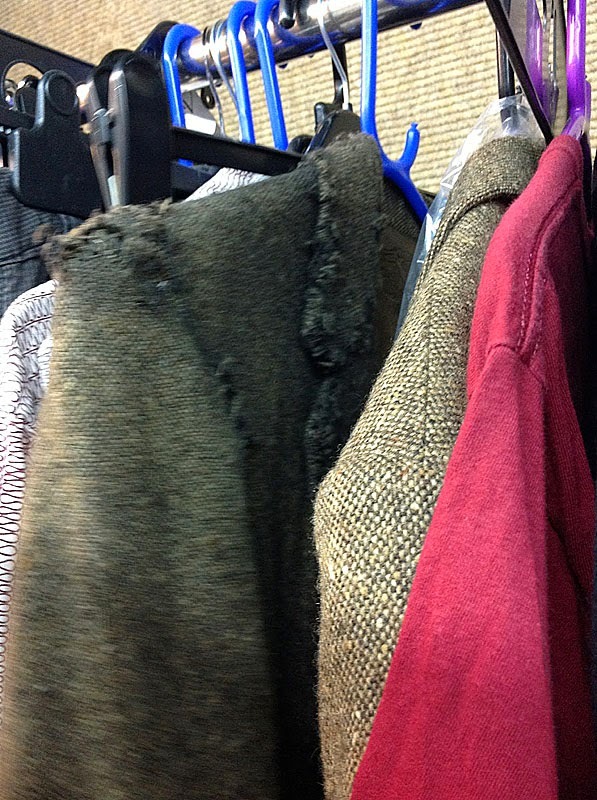 Most of the costumes were pretty standard off the peg clothes used during the Tenth Doctor’s era. But the Eleventh Doctor items proved to be the real treasure trove. 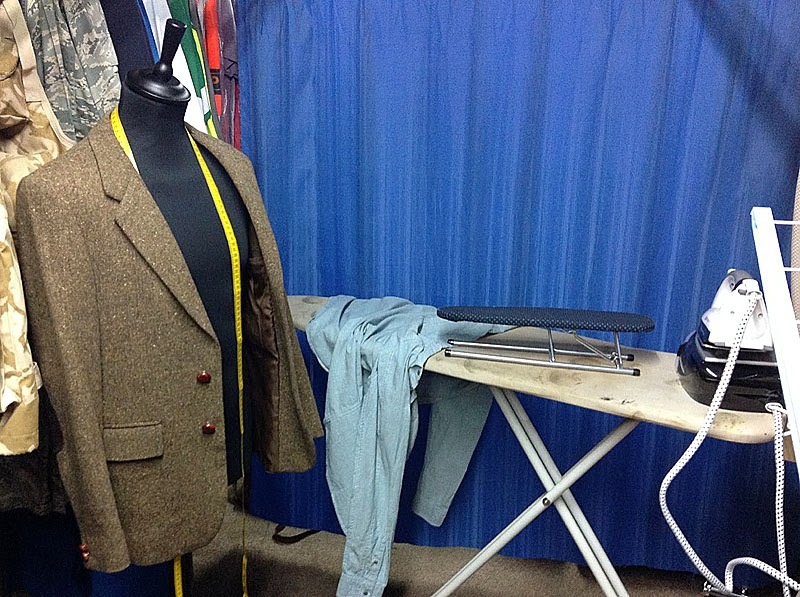 A total of three Donegal tweed jackets were on show. One was on a display mannequin at the far end, along side an ironing board. One the rails was another plain Donegal, plus the heavily distressed, burnt and torn version seen in The Pandorica Opens and The Big Bang. 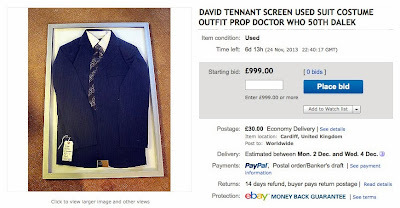 On the final rack was a small, but not insignificant collection of Tenth Doctor costumes. 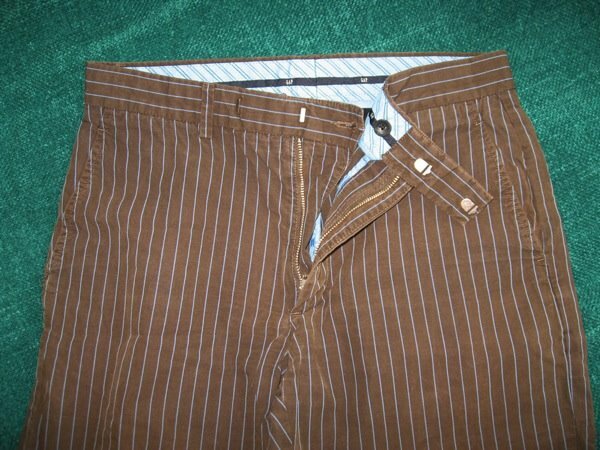 Three pairs of the GAP trousers were hanging up, one pair somewhat torn and distressed, as seen in The Eleventh Hour, or possibly The End Of Time. 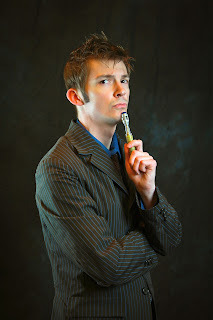 Also here was yet another brown Tenth Doctor suit. 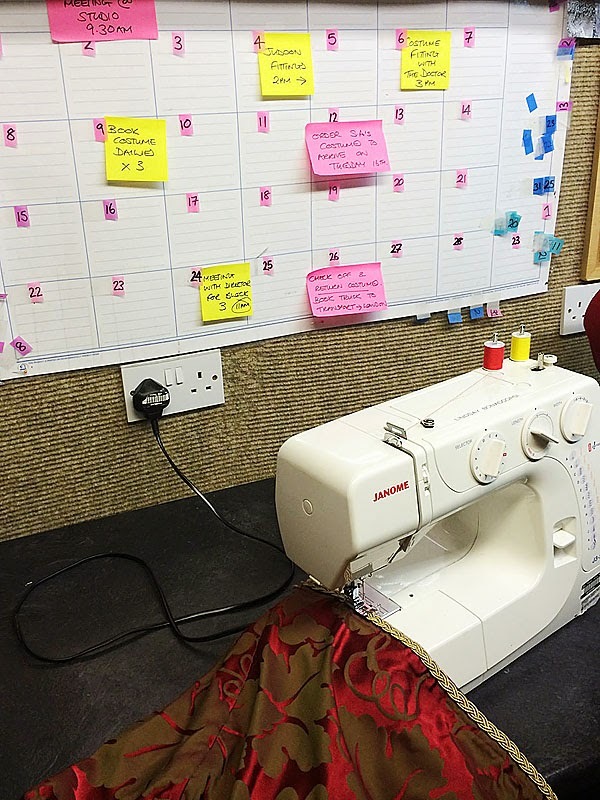 It has you wondering how many suit were actually made! The final gem was a whole fist full of Tenth Doctor ties! 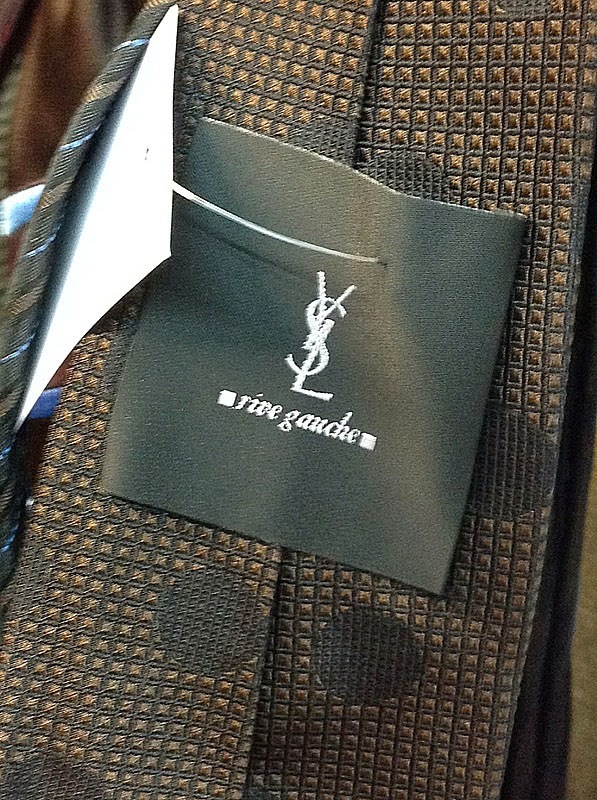 You could rummage through and see Tie 3, the YSL used in School Reunion. 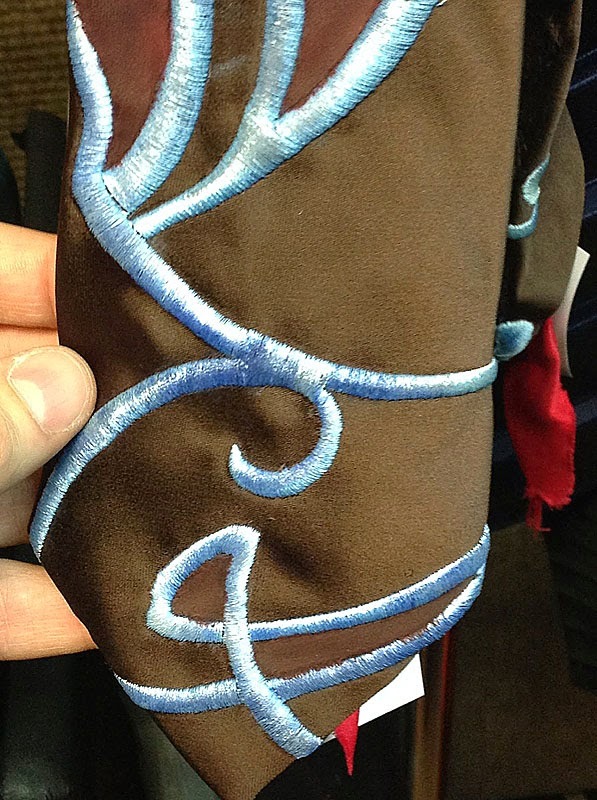 Tie 5, the Thomas Nash tie from The Idiot’s Lantern. 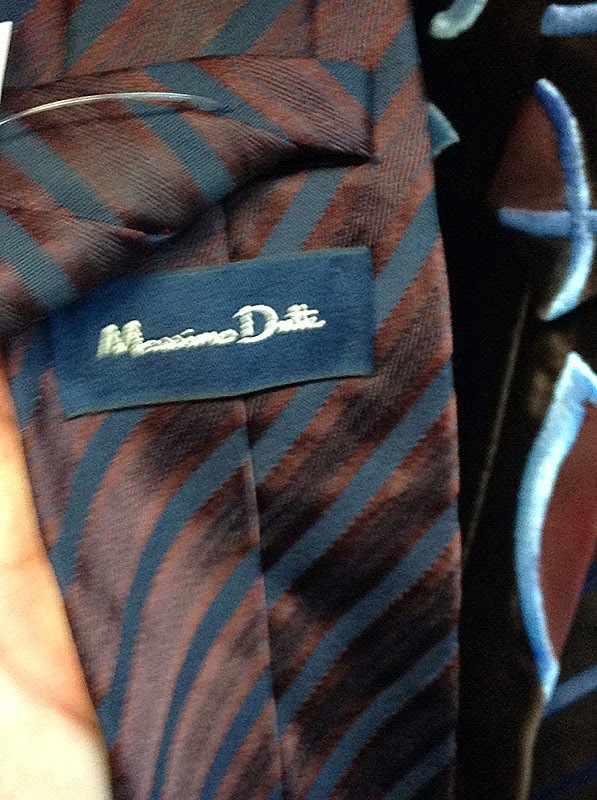 Tie 11, the Massimo Dutti from The Next Doctor. (missing its label on the reverse). Tie 12, the Massimo Dutti from The Doctor’s Daughter. 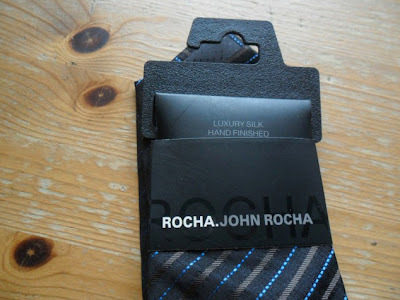 There was also the Rocha John Rocha tie, which was bought but went unused, as well as an unlabelled red and black floral tie, also unused. 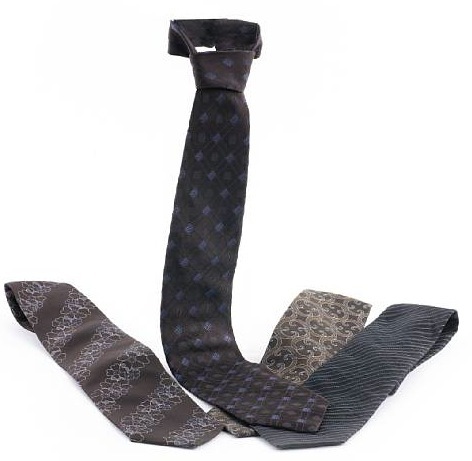 But the prize was the replica Christian Lacroix ties made for The Eleventh Hour. 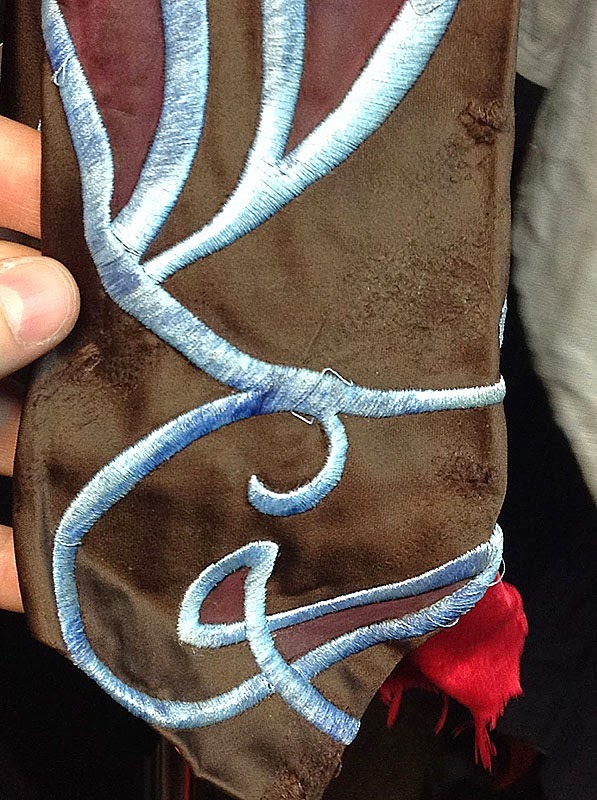 These have the blue swirls embroidered on with the reddish patches. Two were here, one in pristine condition, the other torn and distressed. It was jaw-dropping to discover the red patches on the tie are just fabric painted on by hand. I’m sure we all thought there were sections of red fabric appliquéd on, but as is often with film and tv work, the simplest solution is often the best. It was quite inspiring to see the ties first-hand. I might even have a go at making my own. Hummmm. This weekend’s Doctor Who Celebration has been a feast for the eyes for fans. 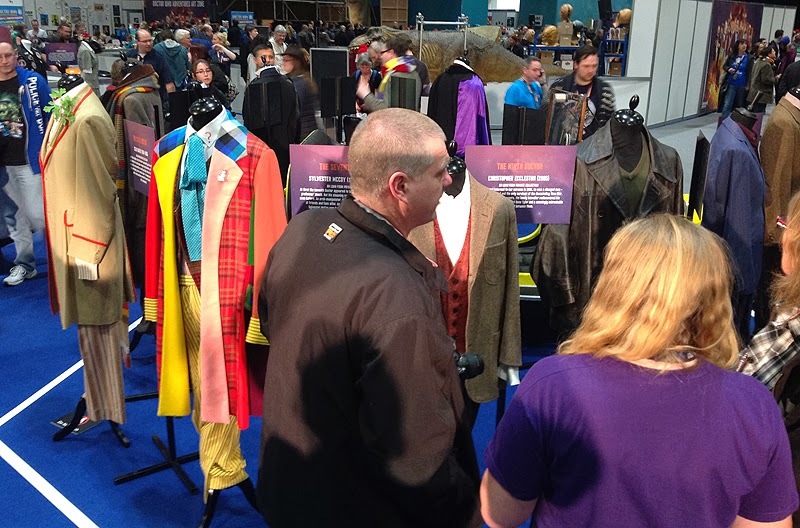 As well as catering for those who have come to Who through the relaunch series, there has been a good nod to the history of the show with a wide variety of guests and an extensive exhibition of costumes culled from Cardiff’s Doctor Who Experience. They had a near complete set of Doctor’s costumes on show (missing was the Eighth and War Doctors) arranged in a circle around Bessie. 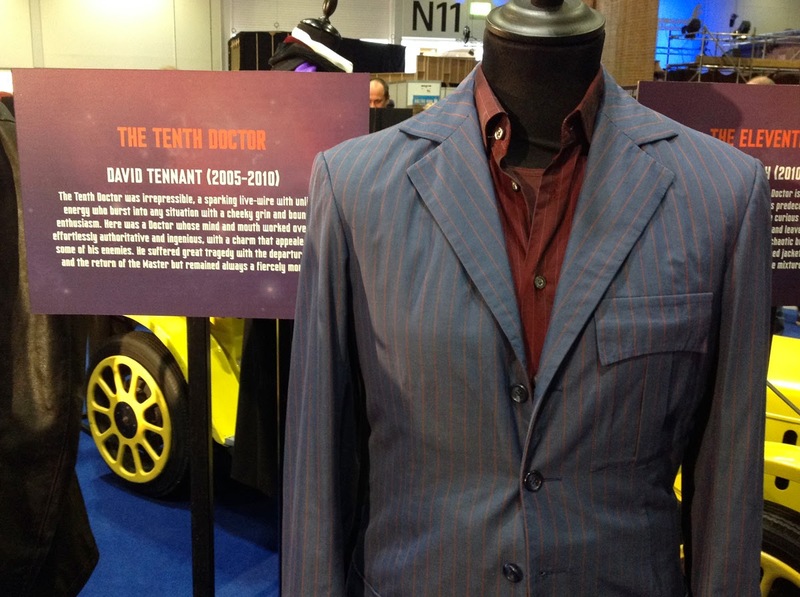 The Tenth Doctor costume on show is not the one from The Experience (that was on the costume department display elsewhere at the Celebration). The blue suit was often on display at the various regional exhibitions prior to the permanent Cardiff base opened. One way or another there was quite a bit of stuff relating the the Tenth Doctor’s era. 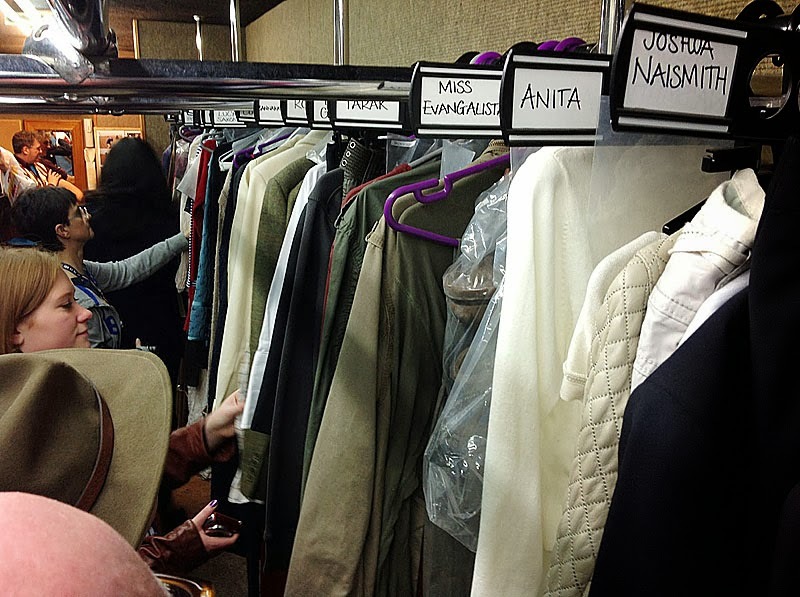 There were costumes from all three main companions, including Rose’s 1050s outfit from The Idiot’s Lantern; Martha Jone’s iconic blood red leather jacket; and two of Donna Nobel’s costumes. 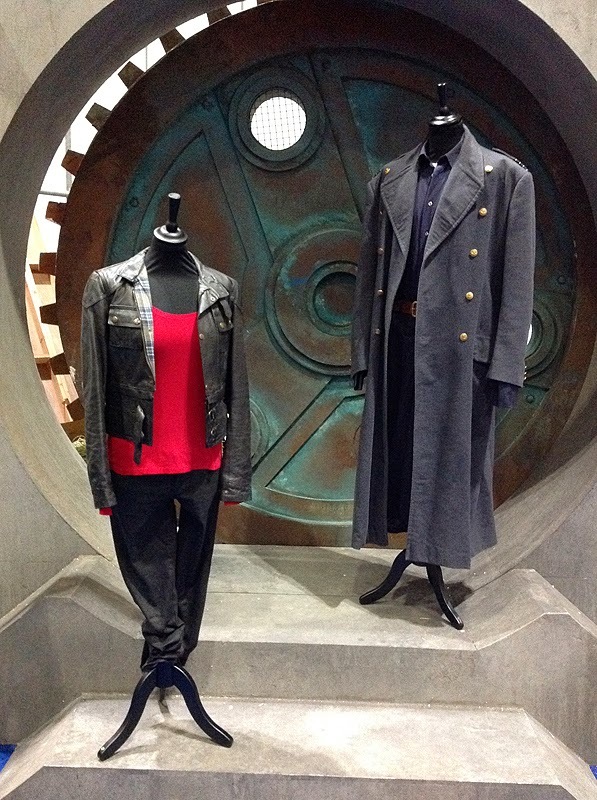 There was also some costumes from spin-off series Torchwood, including Captain Jack’s RAF greatcoat. The Mr Smith attic set from Sarah Jane Adventures, plus her car. 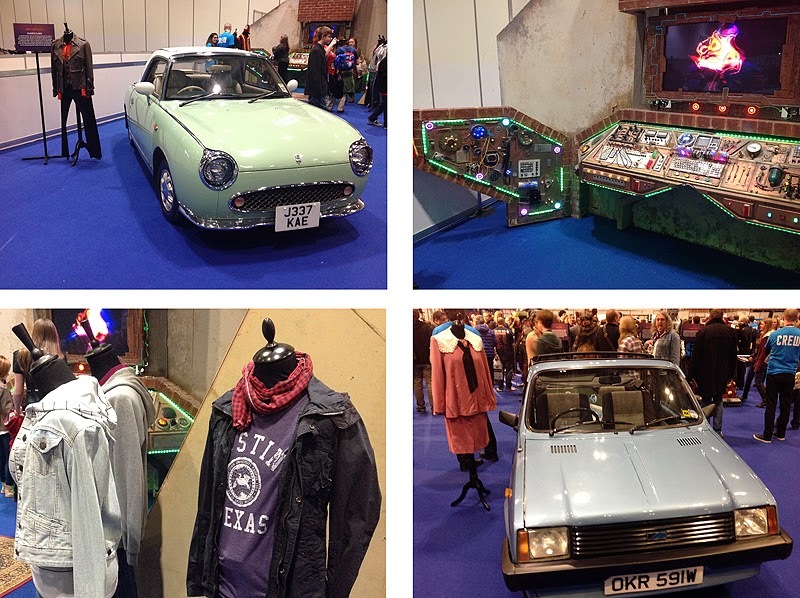 Also on show was Sarah Jane’s car from K-9 And Company. I’ve been in two minds about posting this, but I decided to do so as a warning to other to sometimes be wary of what you see for sale on eBay. The two items I’m highlighting appeared this week, and raised some eyebrows on a number of forums and social media sites. They are so obviously wrong to not take in the savvy costume fan, are named such and come with apparent verifying documentation to possibly take in the less observant buyer. Anyway, I leave you to judge their authenticity for yourself, but for what it’s worth I have my own opinions. It’s less than ten days until the 50th Anniversary special, and the BBC have released some high resolution pictures of David Tennant in full costume. The brown pinstripe suit is back; worn with a classic light blue shirt; off-white converses; and the new St George by Duffer narrow tie. The shirt is a new, as yet unidentified label, rather than a previously worn from the Tenth Doctor era. 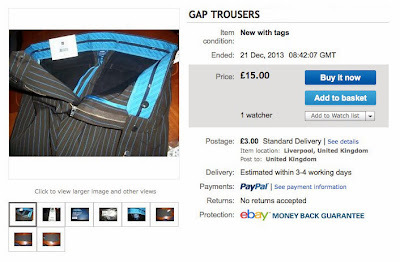 A couple of days ago I showed you a pair of original GAP trousers on eBay that sold for £150. 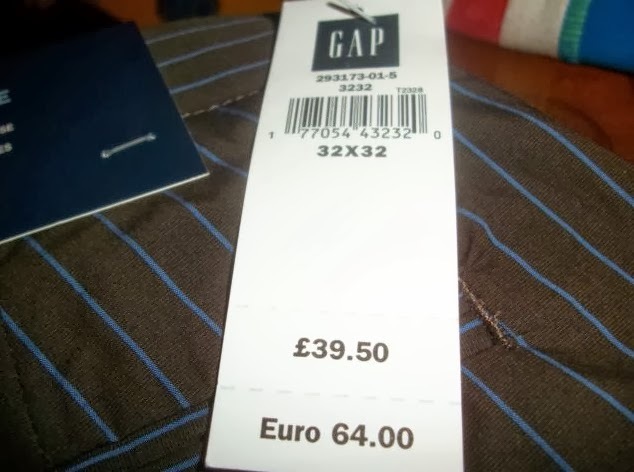 I did wonder who had paid such a sum for one pair of trousers - but I have to confess I knew all along who it was - ME! 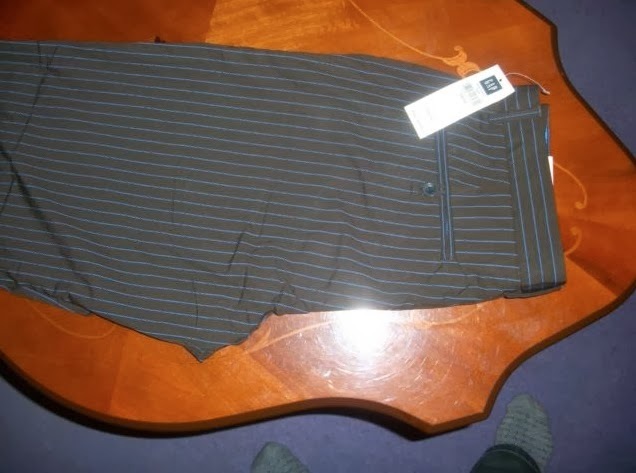 The trousers arrived today, and I must say they are in near mint condition. You might notice in the corner of my photo there are other pairs lurking around. Well, I now actually have three pairs! It’s taken me a few years to get to this stage, so I’m in no real rush. 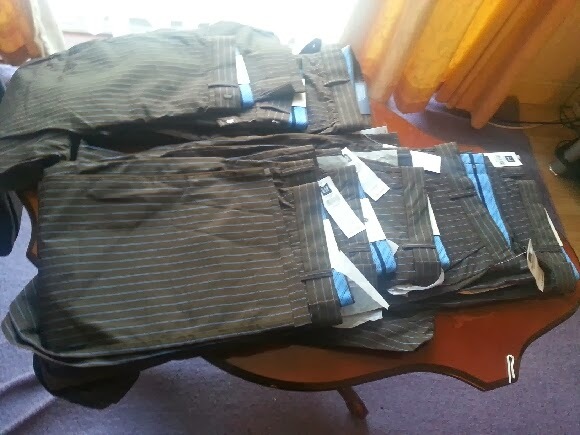 To complete a suit I really need six pairs - one to wear and five to tailor the jacket. 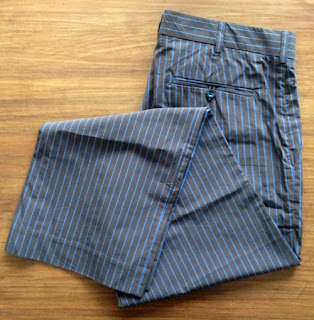 If you have a pair of GAP trousers and are willing to part with them to help me reach my target, please email me at tennantcoat@me.com. 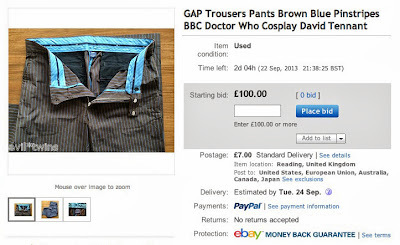 Since 2009 when I exclusively revealed the brand of the fabric used to make the iconic Tennant Suit was from GAP trousers, a few pairs have cropped up on eBay. 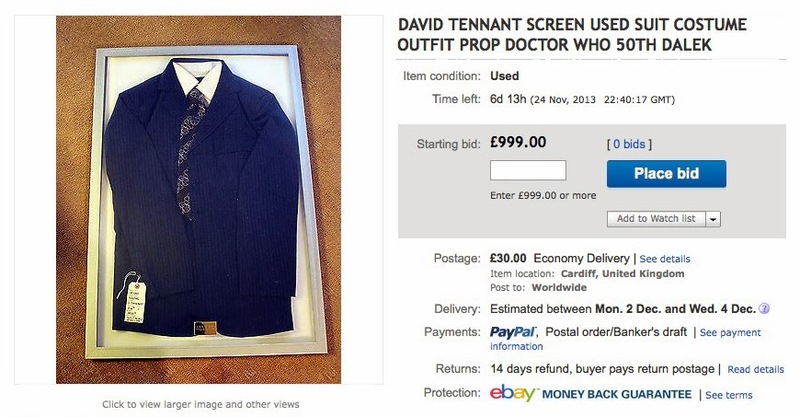 So far only one person, Kevin Coppa, has gathered enough pairs to recreate the suit in the form of the Ultimate Tennant Suit. He was lucky enough to find six pairs from which we fashioned the jacket, based as closely as possible on the original suit. Since then I haven’t seen many pairs for sale, but tonight a pair of size 36 waist closed, selling for a hefty £150 price tag. I wonder who got them? GAP never made a jacket to match these trousers, the one you see the Doctor wearing was made by the BBC costume department from four or five pairs of trousers. I don't think I'll ever find another four pairs so I'm selling these on in the hope that they might help someone else out. Now I’d be the first to admit this is a bit of a non-story since this tie was never screen-worn. But two of the Rocha John Rocha ties as sold at the infamous Bonhams auction in 2010 (see right), were recently sold on eBay. 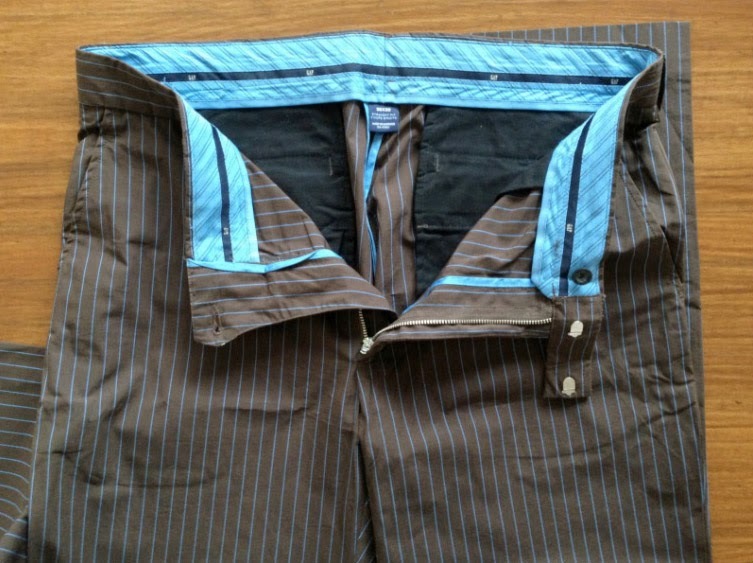 Although she never used it, the tie fell within the rules that costume designer Louise Page set herself - dark brown accented with light blue to reflect the brown suit with blue pinstripes. 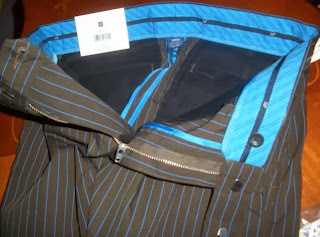 You can see here how it could have worked with the suit and overcoat. Not being one of the sought after ties, they sold for £10.99 each, which is a snip!